Another adventurous and fun horse story! It was nice to follow Poppy and Scarlet away from home. Tense moments and lots of horses! Why, oh why, are these books not available in paperback yet?...Because they would look really good on any pony book lover's bookshelf. Come on, publishers, catch on!This is the third installment in The Riverdale Pony Stories - and it doesn't disappoint. The story line surprised me from the outset as, instead of being based in Riverdale and being concerned with the McKeevers, it sees Poppy and Scarlett leaving their own ponies behind and heading to the Forest of Dean for a trekking holiday after winning a competition in a magazine. Reminded me a little bit of Jackie Won A Pony, one of my favourite pony books. In my 'youth' I went on a week long trekking holiday, where I went alone and then made friends with one girl who had gone there with her friend, so I could really relate to the Poppy-Scarlett-Cally friendship triangle. Very true to life and teenage girls!There are plenty of gorgeous ponies and lots of adventure as well as the usual sensitive analysis of family relationships and friendships. The latter really being one of Wills's strong suits. Plus, much as I do love Cloud (and did miss him a little bit, but so did Poppy, which was the whole point) I couldn't help but fall in love with Beau!Beautiful cover. Great story. Now looking forward to Book 4. 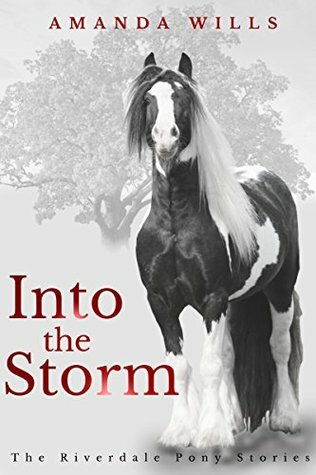 Being set almost entirely at a trekking centre in the Forest of Dean this book is a departure from the pervious two and I missed Chester, Cloud and Poppy's family but I loved the new people and ponies at Oaklands (especially cheeky little Frank! ).Poppy learns some important lessons in this book and her friendship with Scarlett is severely tested. She also struggles to bond with Beau, her mount for the week, and gets involved with the problems facing the trekking centre and its owner. I've ridden plenty of stubborn riding school horses and ponies and the pony I rode on my own first riding holiday shared Beau's determination to eat as much of the countryside as possible so I could relate to Poppy's struggles with Beau and they read very realistically.The ending to Poppy's week at Oaklands is dramatic, and the whole book is an enjoyable read that strongly reminds me of my own experiences at trekking centres. I hope there will be more books in this series.